The following is Part II of a series of articles examining Syrian foreign policy under President Bashar Assad. Part I, published in the March 2001 issue of MEIB, addressed Syrian relations with Iraq. Syrian President Bashar Assad's March 27 meeting with Palestinian Authority (PA) chairman Yasser Arafat on the sidelines of the Arab summit was the culmination of a dramatic improvement in Syrian relations with the PA since the death of Hafez Assad in June 2000. Relations between the Assad regime and Yasser Arafat have always exhibited tensions stemming from a fundamental conflict of interest - both have striven to assert political control over Palestinian communities stretching from the Israeli-occupied territories to Lebanon and Syria. These inherent tensions in the relationship erupted in 1976, when Syrian forces entered Lebanon and clashed with the PLO. Although the 1978 Camp David Accords temporarily led Assad and Arafat to reconcile, their rivalry again erupted when Arafat began embracing the idea of an American-sponsored resolution of the Israeli-Palestinian conflict in the early 1980s. In 1981, Arafat accepted a peace plan proposed by King Faisal of Saudi Arabia and a cease-fire agreement with Israel in south Lebanon, outraging the Syrians, who consequentially did little to assist Palestinian guerrillas in Lebanon against invading Israeli forces in 1982. Assad began openly preparing to destroy Arafat after the Palestinian leader declared his conditional acceptance of the September 1982 Reagan peace plan and Syrian intelligence discovered that Arafat was harboring a number of Syrian Islamists opposed to the Assad regime. In the summer of 1983, after Arafat's defeated guerrillas relocated to the northern Lebanese port of Tripoli, Syria promoted a rebellion against Arafat within the Fatah movement by Col. Abu Musa, whose forces managed to drive Arafat entirely out of Lebanon. 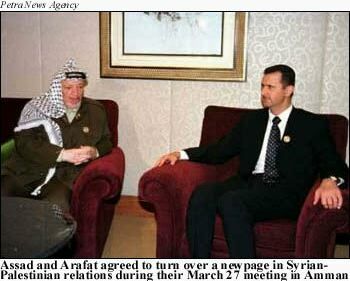 In 1984, Assad's estranged brother, Vice-President Rifaat Assad, met openly with Arafat in Geneva shortly after his forced exile from the country. Meanwhile, throughout the 1980's, Syria continued its brutal campaign of massacres and assassinations against pro-Arafat forces in Lebanon through the so-called National Salvation Front, an umbrella organization consisting of Saiqa (a Palestinian force operating in conjunction with the Syrian army) and extremist Palestinian factions headed by Abu Musa, Ahmad Jibril, George Habash, and Nayif Hawatmeh. Thousands of Palestinians were transferred to Syria and imprisoned in detention centers in an around Damascus. In 1989-1990, Arafat openly backed Lebanese Interim Prime Minister Michel Aoun in his "war of liberation" against Syrian forces in Lebanon. The conflict between Arafat and the Syrian regime was further fueled by Arafat's decision to secretly negotiate the 1993 Oslo Accords with Israel, a move which Assad considered to be an underhanded violation of the comprehensive peace framework established at the 1991 Madrid conference. Syrian sponsorship of Arafat's leftist and Islamist opponents in the West Bank and Gaza proved to be a powerful tool in discouraging Palestinian concessions to Israel. In 1998, Palestinian-Syrian relations reached their lowest point in years. In July, Rifaat Assad's son, Sumer, traveled to Gaza and was warmly received by Arafat. During his visit, Sumer publicly praised the "friendship" between Arafat and his father. Syria quickly retaliated. On August 2, Syrian Defense Minister Mustafa Tlass publicly condemned Arafat in an unusually graphic speech (even for Tlass). "Son of 60,000 whores . . . you should have told the White House that Jerusalem is the capital of the future Palestinian state. Instead you stayed as quiet as a mouse and did not dare say even a single word in favor of Palestine or Jerusalem," declared Tlass. "Look at him when he's on the stage," he continued, "he moves from concession to concession, like a stripper, except that [the stripper] becomes more beautiful with every layer she removes, while Arafat becomes uglier." This sparked anti-Syrian demonstrations in Gaza, the West Bank, and the Ain al-Hilweh refugee camp in Lebanon. The death of Assad in June 2000 removed an important impediment to the improvement of relations between the two sides. As Syrian political commentator Ghassan al-Imam noted in 1998, Assad "is a meticulous, organized, cautious and serene person . . . he is serious and keeps his word," whereas Arafat "is less cautious and more prone to political U-turns." These differences, he said, made "a healthy relationship impossible to establish." After the eruption of the Al-Aqsa Intifada last year, which appeared to destroy the Oslo peace process that had raised the ire of Assad's father, Palestinian and Syrian officials started discussing a reconciliation through intermediaries. Farouk Qaddoumi, the chairman of the PLO's political department who had initially distanced himself from the Oslo Accords, made several trips to Damascus on behalf of Arafat. Earlier this year, Assad and Arafat began speaking regularly on the telephone. The Assad regime's new posture towards the PA has been mirrored by its client regime in neighboring Lebanon. During the Amman summit, the Syrians permitted Lebanese President Emile Lahoud to meet with Arafat - the first time since 1982 that a Lebanese head of state has met with the Palestinian leader. Last month, a member of Lebanese Prime Minister Rafiq Hariri's parliamentary bloc, MP Nasir Qandil, met with the secretary-general of Arafat's Fatah movement in Lebanon, Sultan Abul-Ainein, at the Rashidieh Palestinian refugee camp in Lebanon. However, while the meeting was publicized as a Lebanese-PA diplomatic breakthrough, it is noteworthy that Qandil is a close confidant of Assad - the Syrians clearly want to keep closed tabs on this relationship. 1 Al-Arab al-Yawm (Amman), 7 August 2000. 2 Al-Ayyam (Ramallah), 25 January 2001. 3 Al-Sharq Al-Awsat, 9 February 2001. 4 UPI, 27 March 2001. 5 Al-Hayat (London), 25 March 2001, SANA (Damascus), 26 March 2001. 6 Al-Majd (Amman), 2 April 2001. 7 Al-Madina (Saudi Arabia), 4 April 2001. 8 Al-Hayat (London), 19 April 2001. 9 AFP, 15 April 2001.